Today we had Jim Greene from JMR Systems and Rob Masek from Paperless Parts in to LM for a training day of the Rapidform XOR scan data processing software. 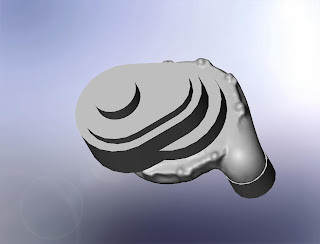 This software allows engineers to capture the design intent of a scanned part and extract both the prismatic features and the freeform surfaces for use in a CAD package such as Solidworks. The interface works nearly exact to SolidWorks, so this is a nearly seamless transition for our team from scanned data into a model that can be identified and mated to assemblies in SolidWorks. To maximize our learning today, we covered the basics using a model that Jim uses in his standard first day of training and then moved on to a part more specific to our industry and one that closely represents the types of scans we will have to manipulate. Specifically, the part is a Powerdyne Supercharger which has features easily identified as holes, cylinders, circles and planes, but also has some complex freeform geometry. Just like we theorized, this model allowed us to get some in-depth training beyond the standard method so we can jump right into scanning and processing parts now that we have the results from our second design competition and will hit the ground running on the first LM prototype. Supercharger with IR targets in place for scanning. As you can see from the difference between the photo and the SolidWorks image, we did not model the supercharger in full detail. The software does have this capability, but the good thing about the XOR package is that you can capture a full level of detail, or you can focus only on what is important and get the model into SolidWorks as quickly as possible as a part with prismatic features that SolidWorks can identify. Therefore, we did not model the bolt heads as bolts (we left them as rough scan data) for example, but we would still be able to see if they are interfering with another part in an assembly if we were to mate the supercharger to another assembly since the rough outline of each of the bolt heads is still represented in the model. Overall, this is a very powerful tool that can automate much of the process, but also allow the user to apply some judgment in creating the part to obtain an output that fits their needs, whether it be a part direct from the scan, a very simple representation of the part, or a fully detailed solid model or a hybrid of each as with the supercharger.